Stephen Tsikalas attended his first AWW workshops in 2014. He got certified as both a water chemistry and bacteriological monitor, then, in 2015, advanced to become an AWW trainer. 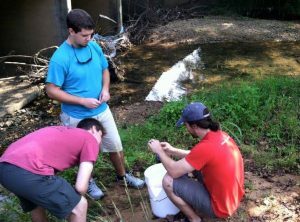 He has integrated AWW water monitoring into his Geography curriculum at Jacksonville State University, where he teaches. 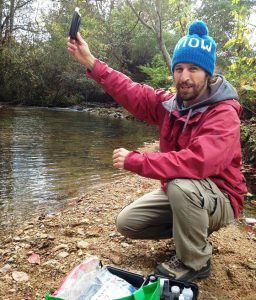 Water quality monitoring provides the students with real-world beyond-the-classroom field experience that melds seamlessly into their Geography studies. 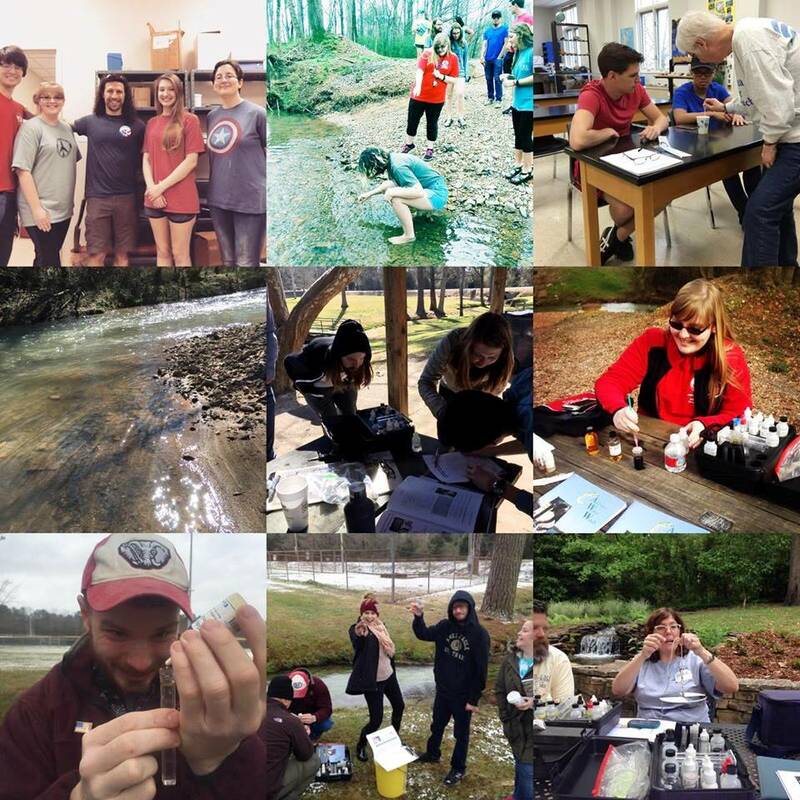 Over the past two years, Stephen and his students have monitored local streams and springs in the Jacksonville area, and Stephen has conducted or assisted in several AWW trainings, certifying more than 75 new citizen volunteer monitors! Stephen monitoring water chemistry at local stream near Jacksonville. I hail from Ebensburg, PA, spent several years in central Texas, and now call Jacksonville, AL my home. I’ve been an Assistant Professor of Geography at Jacksonville State University (JSU) for nearly four years now, and I love it! 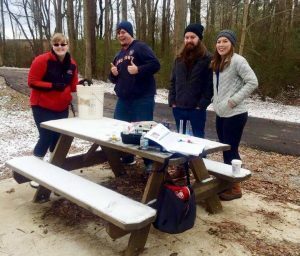 In January of 2014, Jade Patolo and I started an AWW group called the Jacksonville River Monitors (JRM), based out of the Department of Physical and Earth Sciences at JSU. Whitney Henson (a current JSU graduate student) has also played a vital leadership role in the JRM since its inception. The JRM is mainly composed of JSU geographers, but we also have students from other disciplines such as biology. Since January 2014, the JRM has conducted monthly chemistry and bacteriological monitoring. We also run at least two AWW chemistry and bacteriological trainings a year. We welcome anyone to attend our trainings! Here is a link to the JRM Facebook site: https://www.facebook.com/JacksonvilleRiverMonitors/?fref=ts. Jacksonville River Monitors are not only enthusiastic, but extremely dedicated to year-round monitoring! The Chief Ladiga Trail runs through Jacksonville. I often find myself on the trail, especially around dawn or dusk. My favorite spot along the trail is where it runs over a small tributary of the Tallaseehatchee. I enjoy standing on the little wooden bridge and listening to the stream. This spot also happens to be one of our AWW sampling locations! I enjoy sitting near or walking along a stream and taking in the sounds and smells. I find a babbling brook to be very comforting and one of the best ways to clear my cluttered mind! My wife, Jade Patolo, got me interested in AWW. Also, Francine Hutchinson played a vital role in getting both of us trained and certified. Thanks, Jade and Francine! Stephen and students conducting a bit more ‘seasonable’ sampling on a local stream. Lately, it’s been lack of rain! Overall, though, the challenge is trying to get others to appreciate water as our most precious resource in Alabama. 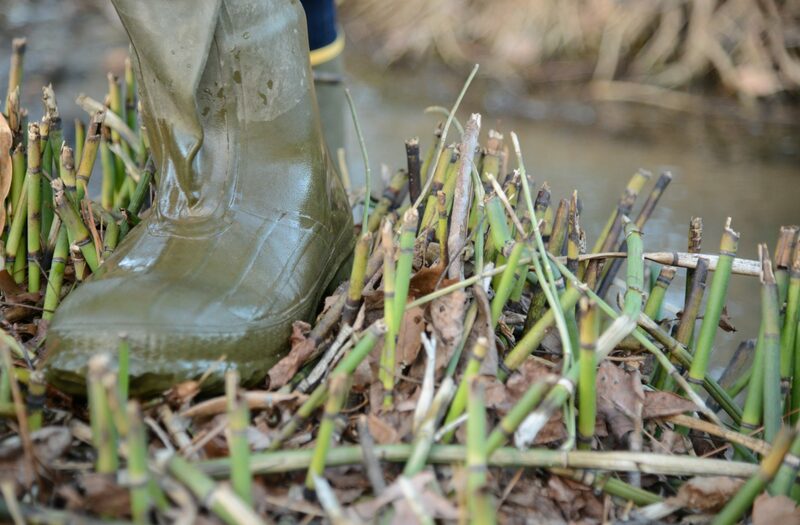 Seeing litter in and along our streams really bothers me. Like other AWW sampling locations across the state, we also struggle with non-point source pollution. When I first became a monitor, I thought the volunteer work would be more of a giving than a receiving activity. I quickly discovered though, that I gain more from the experience than I think I am giving. Establishing the Jacksonville River Monitors with the students at JSU has been such a rewarding experience. We have a great time volunteering together and look forward to it each month. Water quality monitoring has become my favorite way to spend a Saturday morning, and I recommend it to anyone!